Originally a tall sand dune, it became a public park in 1850 and was named after the pro-Union rallies held there on the eve of the Civil War. The white monument in the middle was dedicated to Admiral George Dewey’s victory at the Battle of Manila Bay during the Spanish-American War. 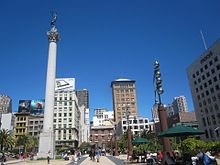 The size of the public plaza is 2.6 acres, or 1.1ha,bordered by Post, Powell, Geary, and Stockton Streets. Today, it has become the centre of shopping, hotel and the theatre districts. Among the department stores are Macy’s, Neiman Marcus and Barney’s. It also serves as the site of many public concerts and events, art shows, protests, private parties and events, winter ice rink and the annual Christmas tree and Menorah lighting.